In the North African biosphere, the prey biomass densities are much lower than in the savannahs of Sub-Saharan Africa or the dry forests of western India. 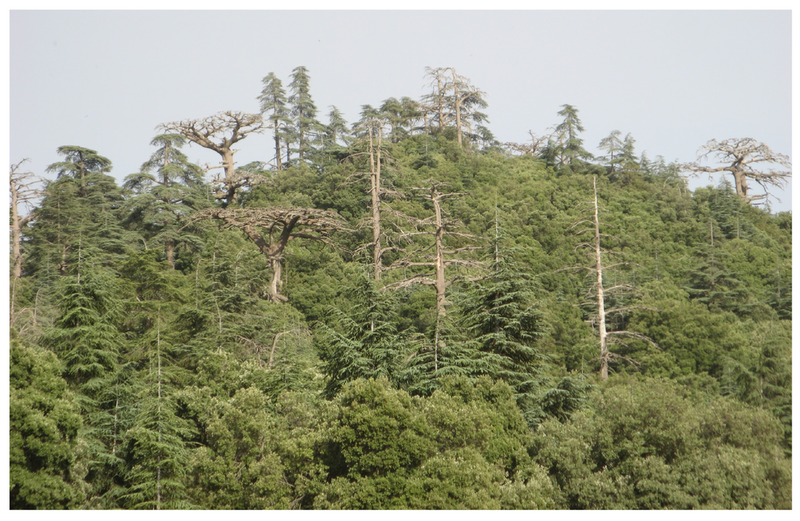 The Moroccan Atlas is likely, on average, to be able to support probably less than four lions per 100km2. In the Gir Forest in Gujarat, India, where domestic livestock as a supplementary prey base, the carrying capacity of lions is estimated at around 15 lions per 100 km2 (Banerjee et al., 2013). Translocation of lions in India has been planned for some time. The planned release site in Kuno Wildlife Sanctuary (an area of 900 km2) would involve reintroduction of only 5-8 animals intially (with plans to move 1-2 adult males every 5 years out of the sanctuary). So, even in a relatively large and currently established wildlife habitat with a reasonably dense prey base, only a very small number of lions would be released. Additional complications of home range size and number of groups would be a major constraint for any lion reintroduction in North Africa. Would North African animals live in large prides as cmomonly encountered on the African savannah, in family groups, or would a single lioness holds resource territory while male coalitions attempt to maximize female groups within their range, as in India? (Black et al., 2013; Yadvendradev et al, 2009)? Yamaguchi N, Haddane B. (2002) The North African Barbary lion and the Atlas Lion Project. International Zoo News 49 (321): 465-481. This entry was posted in Conservation, Ecology and tagged Atlas Mountains, India, lion, reintroduction on April 22, 2015 by Simon Black. 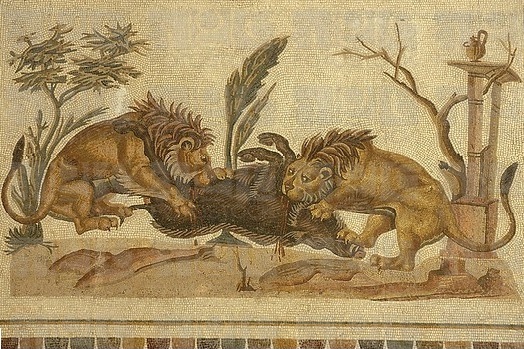 This 2nd century Roman mosaic from Tunisia is a fine example of its genre and interesting for its depiction of lions, a not unfamiliar scene in artwork of the era. The picture manages to look both familiar and unfamiliar at the same time. Two lions devouring prey, yet it is two male lions. The prey is relatively large compared to the lions but it is only a pig. The scene is a dry and sparse climate and there are depictions of human presence a temple or palace perhaps… all somewhat fanciful, surely? There are many pre-Roman artistic depictions of lions devouring prey in Mediterranean art (bulls, deer etc.). 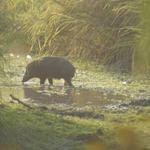 Perhaps fewer of lions eating wild boar. We do know that wild boar are the prey of lions in India today and boar would have been prey elsewhere in the former middle eastern range of the species. 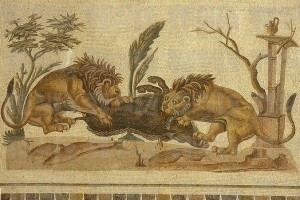 They would also have been a key prey for lions in North Africa as depicted in the mosaic. If lions were still present in the wilds of Algeria or Morocco today, then wild boar would probably be the best food source (other than domestic flocks). We know that Barbary lions tended to operate in small family groups rather than the prides familiar in savannah landscapes, so it is interesting to see two males in this depiction – does this offer a clue to how Barbary lions behaved, perhaps? In reality almost all lion depictions of the classical era show male lions and almost never lionesses, so little can be gained from this depiction. The Tunisian mosaic is most probably a purely artistic interpretation of events. It is satisifying, however, to see the lions depicted with a known wild prey species form the region. In classical European artwork lion prey is more often depicted as domestic cattle, donkeys, horses or wild deer. Interestingly 18th and 19th century art often depicts lions attacking horses and domestic camels. This entry was posted in Cultural Impact, Ecology, History and tagged lion, Tunisia on April 8, 2015 by Simon Black.